What did you love best about Mustaine? I never liked Dave Mustaine, he always came across as kind of a jerk. This book confirmed all of my suspicions but also makes him a very sympathetic character. A lot of times he's his own worst enemy and he comes close to admitting that but in the same breath always manages to blame someone else. He's an alpha male rock star and being a jerk comes with the territory but Megadeth backs it up with a career filled with legendary songs. He has lots of great stories about Metallica, Megadeth, and the many people who came and left the band. He's very open and upfront about his substance abuse and the difficulties it caused. A lot of unintentional humor comes from hearing him tell a story and then imagining how other people in the room saw the same story play out but drew very different conclusions. The man is a legend but he's also the neglected kid who lashes out at everyone because he learned early on that no one was looking out for him so he would have to do it himself. All the stories about early bands, Metallica, and all the Megadeth stories. Which character – as performed by Tom Wayland – was your favorite? Dave Mustaine. He does Dave better than Dave does Dave. The narration is incredible. 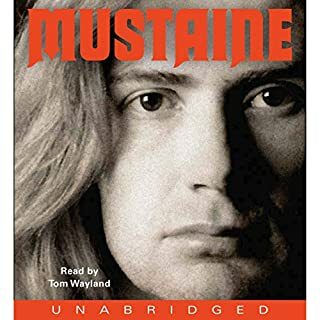 Tom Wayland sounds like Dave Mustaine and he delivers the stories with the intensity and righteousness that they deserve. I always liked Megadeth's music but never liked Dave himself. This book really helped me understand who he is and where he came from and why he is the way he is and it has a lot of great stories about the various band line-ups and the trials and tribulations of touring while addicted to drugs. I've read/listened to many musician autobiographies and this is one of the best. Would you try another book from Kevin Hearne and/or Luke Daniels? 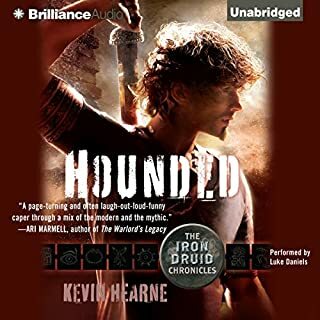 I would not try another book by Kevin Hearne. Luke Daniels tries gamely to bring the book to life but is hampered by the wretched prose. The fact that a 2100 year old druid has spent all this time alive and has no wisdom to show for it. The main character is shallow, adolescent, and not sympathetic. What character would you cut from Hounded? All of them. This book is a waste of time. It's possible that this writer might develop into a decent author but this book is half-baked and that's the nicest thing I can say about it.